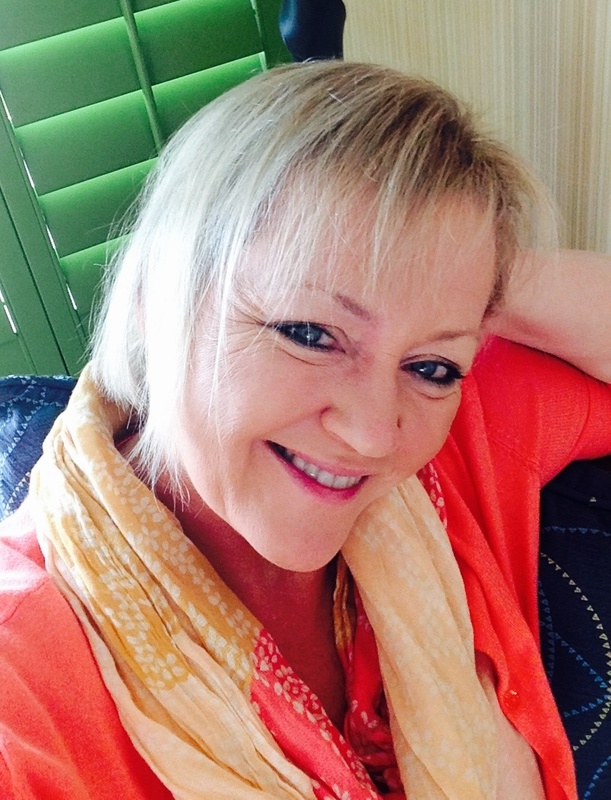 For a grandmom, nothing’s better than playing with the grandkids. 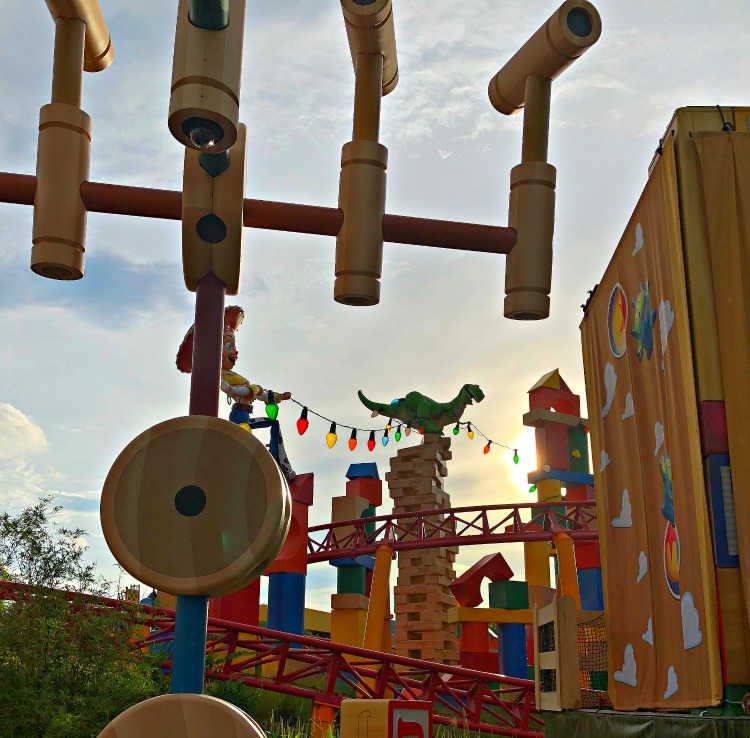 With the recent opening of Toy Story Land at Disney’s Hollywood Studios, you’ll find an entire park dedicated to playing. It all happens in Andy’s backyard. Our Globetrotting Grandmom checked it out. 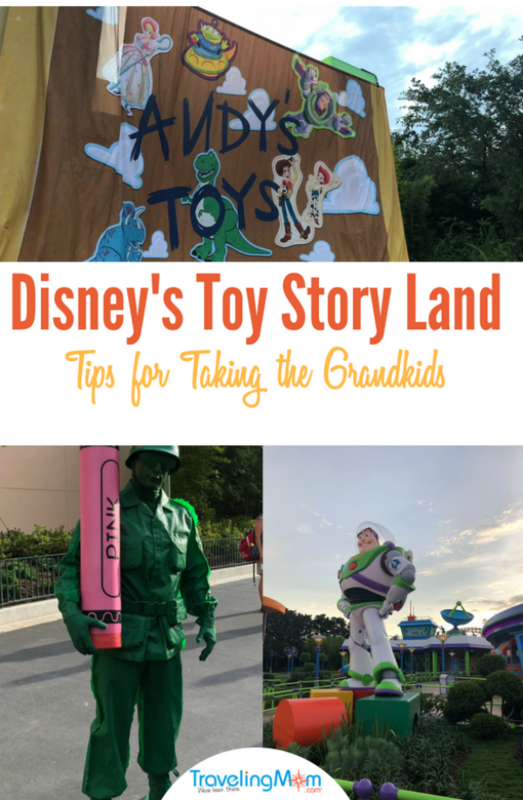 She’s bringing you the complete Disney Toy Story Land guide for grandparents including ride information, tips on dining and where to find the best souvenirs. Gather up the Grandkids and Head to Disney’s Toy Story Land! You’re never too old to play. Experts tell us that play can alleviate stress, is good for your heart and can even make your brain grow. If it’s been too long since you’ve played, take a break from adulthood. Gather up your grandkids and head to Disney’s Toy Story Land. Located in Disney’s Hollywood Studios, the new 11-acre land brings the magic of the beloved Toy Story films to life. Enter Andy’s backyard where you’ll be surrounded by giant toys. Building blocks, Tinkertoys, yo-yos, Scrabble tiles, board-game pieces and even a giant roller coaster set deliver a big dose of childhood nostalgia. Follow the Green Army Men and look for Sheriff Woody, Buzz Lightyear, Jessie, Slinky Dog and all the lovable characters from the films. 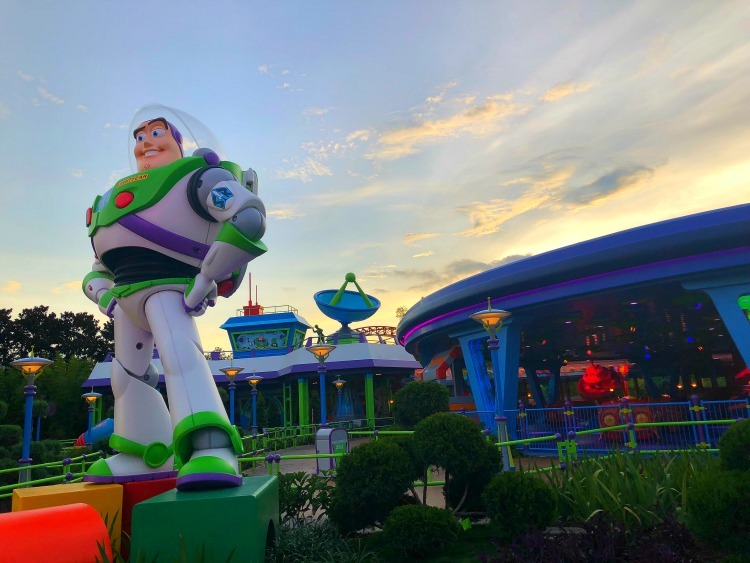 From Alien Swirling Saucers to the Slinky Dog Roller Coaster, you and the grandkids will be entertained from the moment you step inside this magical land. Standing nearly 20-feet tall, Sheriff Woody greets everyone with a tip of his wide-brimmed hat. Toys are everywhere in this fun-filled land. Why not play your own game of “I Spy” as you discover building blocks at every turn, benches built from Lincoln Logs and Crayola crayons? 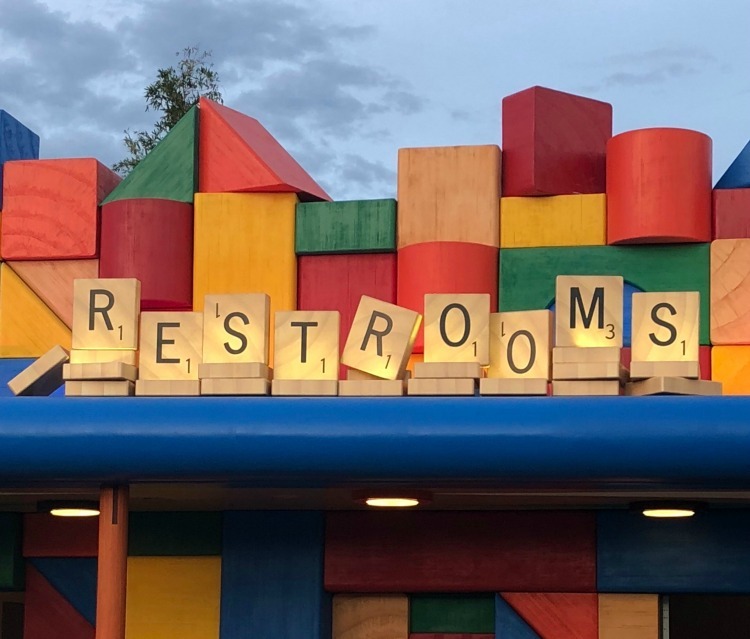 Scrabble tiles as restroom markers are another fun example of Disney’s attention to toy details. Assembled from Andy’s Dash & Dodge Mega Coaster Kit, the Slinky Dog Dash provides old-fashioned roller coaster thrills. 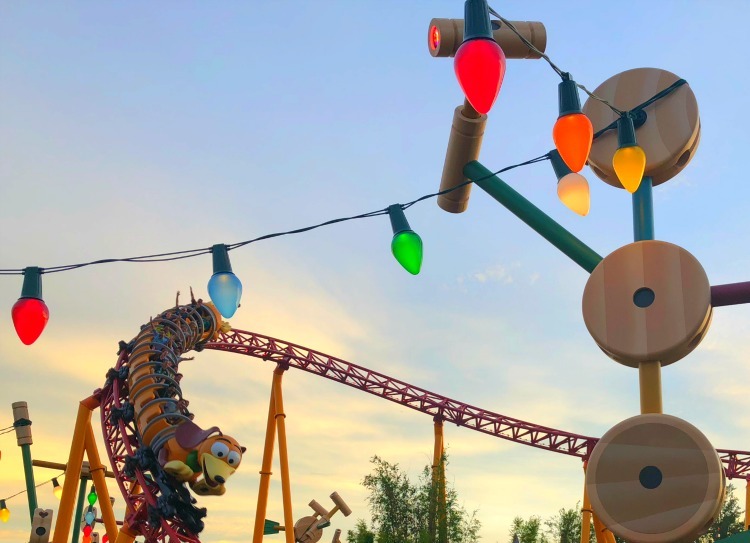 Bending and twisting his coils around curves, shooting through multiple rings with spinners and flashing lights, and dropping down stomach-lurching camelback humps, the Slinky Dog evokes squeals of delight from everyone. Beyond the heart-pumping thrills, there are many hidden surprises to look for with the grandkids. As you swoop around blocks Andy stacked around his Jenga game, look for Rex, the toy dinosaur, stringing up colored Christmas lights from his precarious perch atop the unstable Jenga stack. Watch for Wheezy, the squeaky penguin, singing ”You’ve Got a Friend in Me” at the coaster’s finale. Spinning out of this world, the Alien Swirling Saucers are another favorite ride for thrills in Andy’s backyard. Designed as a playset Andy won at the Pizza Planet restaurant, the galactic space toy swirls everyone in toy rocket ships—with little green aliens along for the ride. Enter Andy’s Toy Story Mania! game to experience carnival playset action where virtual objects from baseballs to creampies aim to hit the targets and win a prize. Woody’s vintage lunchbox is now Disney’s newest quick service restaurant. Growing up, my kids never had the treats you’ll find at Woody’s Lunch Box. No boring PBJs here. 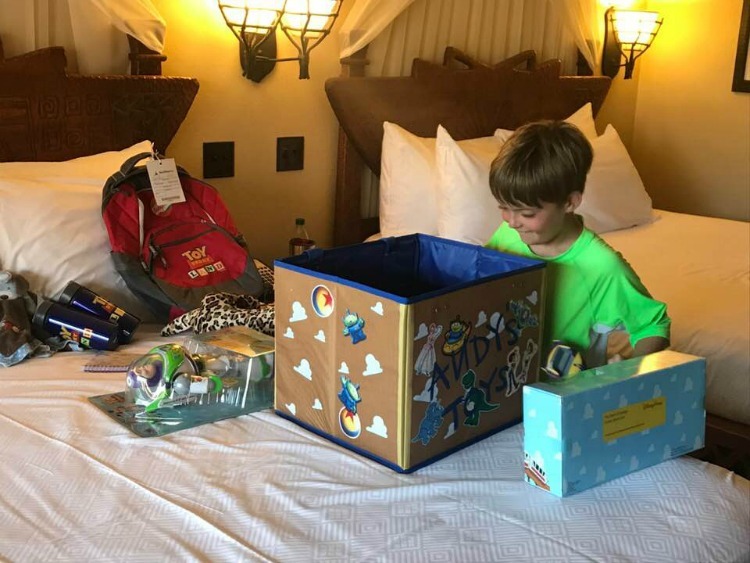 Serving food from park opening until the toys close up shop, Woody’s Lunch Box puts a fresh spin on nostalgic favorites. How does this sound for breakfast: chocolate ganache and marshmallow-stuffed French toast topped with graham cracker crumbs? Ridiculously delicious, right? That’s the S’more French Toast. Pop tarts have been upgraded too. Starting with a delicate crust, the Lunch Box Tarts are toaster pastries on a much grander scale, with high-quality fillings like raspberry or chocolate-hazelnut. Icing and dried fruit top off the Raspberry Lunch Tart while Icing and Caramelized Bacon top off the Chocolate-Hazelnut flavor. Looking for something on the savory side? Give the Grilled Three-Cheese Sandwich a try. Filled with a gooey sharp cheddar cream cheese spread layered in provolone and cheddar and wrapped inside garlic butter grilled French bread, you can’t go wrong with this one. The kids’ menu includes grilled cheese or turkey sandwich with potato barrels and mandarin oranges. And as the official snack cheese of the Walt Disney World Resort, you’ll find Mini Babybel snack cheese too. Wash all this delicious-ness down with a classic Barq’s root beer float or a Mystic Portal Punch (PowerAde Mountain Berry Blast flavored with lemon-lime and tangerine). If Grandmom needs a pick-me-up, there’s a Grown Up’s Lemonade with cherry vodka—it’ll help you make it through the rest of the day! TravelingMom Tip: Skip the line by using Disney’s mobile ordering. You’re the grandmom; it’s inevitable that you’ll be buying a souvenir to commemorate playtime with the grandkids…get ready! Housed in a toy dump truck and a toy camper, even the shops in Toy Story Land are playful. And of course, Toy Story characters are the stars in the merchandise. My grandson’s favorites included the Buzz Lightyear Bubble Blower that shoots bubbles out of his helmet as his chest and arms light-up. He’s also a big fan of the Slinky Dog headband—why wouldn’t he be? And if aliens are more your grandkids’ style, there an optic-green headband with a row of space Alien eyeballs. 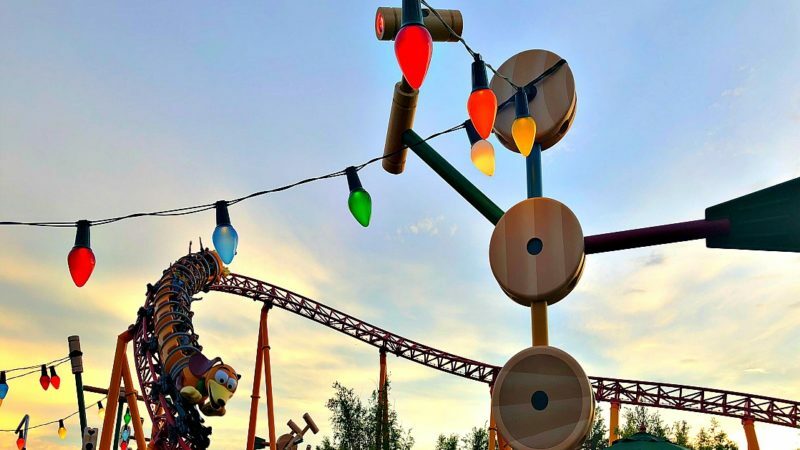 Love your obvious delight—sometimes we grandparent just “for” the kids but Toy Story Land definitely sound fun for all of us. Perhaps grandparents remembering those toys can play even more so! 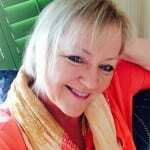 Thank you so much for sharing an amazing article.